Wednesday, 11 a.m. - 5 p.m. 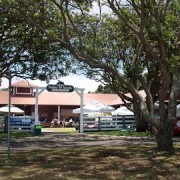 This farmers market is sponsored by the Paniolo Preservation Society and takes place every Wednesday from 11 a.m. to 5 p.m. at the Pukalani Stables at the corner Pukalani Road and Ala Ohi’a Street in Waimea on Hawaii Island. Waimea has a wealth of growers and many of them can be found here at this market. The focus of this market is very locally-grown -produce, coffee, goat cheese, fresh baked artisan breads, macadamia nuts, chocolate and more.